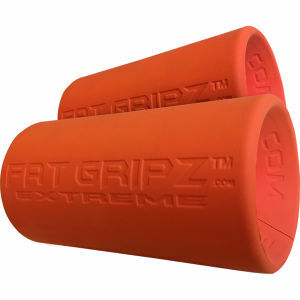 Fat Gripz™ are the training aid that can help support your workouts by widening the width of your grip. Fat Gripz™ are used by champion bodybuilders, elite sports teams, the military, powerlifters, and combat athletes. I was a bit sceptical about these fat gripz but the second I used them I realised how effective they are. I snapped a tendon in one of my fingers and have struggled for grip strength since, these work. My grip strength has tripled and my forearms are finally popping out! They make basic exercises eg hammer curls 3x harder than normal so you have to train even harder. Also as I have big hands on movements like skull crushers and bench press it's more comfortable to hold than a normal bar. The only thing that's bad is when they get wet they become slippy, you just need to dry them and your back up and running. For anyone looking to change up their routine or wants to improve their forearms and grip strength this is a must have. Great product. My arms were in tatters after the first session!!!!! Been curious about these for awhile as I’ve been trying to increase grip and fore arm strength, and oh boy these do the job. Definitely increase the difficulty and they’re easy to use. Most arm, chest & shoulder workouts. Beneficially for some back exercises like rows. I saw these advertised and read previous reviews which were all good. I ordered from myprotien as they were the cheapest for genuine Fatgripz. ordered on Sunday arrived on Monday. used for the first time Tuesday and what a difference they made. They are probably the best training aid I have ever bought. they do exactly as promised. I dropped my weight considerably and what a pump, I would highly recommend these. Makes your weight sessions that little harder and pushes your whole arm that little more.